Nominated for five 1997 VFX HQ Awards: Best Visual Effects, Best Sequence (Safari), Best Invisible Effects (Drive Into Stadium), Best CG Character Animation and Best Compositing, Winner of Best CG Animation and Best Compositing. 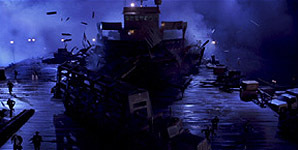 1993's JURASSIC PARK not only broke box-office records around the world, but also marked a significant time in the evolution of visual effects. Previously, 3D computer generated imagery (CGI) was used sparingly in such films as THE ABYSS and TERMINATOR 2, but the artists and engineers at Industrial Light & Magic pushed the envelope for Spielberg's dinosaur epic, creating full-motion CGI dinosaurs for the 1993 blockbuster. Four years later, Spielberg and Industrial Light & Magic have teamed up once again for the sequel, THE LOST WORLD--John Hammond (Richard Attenborough) has secretly maintained Site B, another isolated island full of wild dinosaurs. Hammond hires Ian Malcolm (Jeff Goldblum) to document this lost world. Since 1993's JURASSIC PARK, ILM has achieved some remarkable new innovations in computer generated character modeling and animation. The introduction of the family of Stegasaurus dinosaurs gives the ILM crew an opportunity to show off their highly detailed, realistic textures developed for THE LOST WORLD. A nervous parent? The T-Rex stalks through San Diego on a murderous rampage, attempting to locate her baby. ILM paid careful attention to lighting, shadows and fog in these sequences to lock the CG T-Rex into the background plates. Much has changed in the effects industry since the first film. While background plates for the original usually consisted of static, non-moving shots with only a few moving camera shots, Spielberg wanted to shoot THE LOST WORLD just as a wildlife photography crew would shoot wild animals. This meant background plates with violent, seemingly random movement--hand held shots, cranes, dollys, camera-car tracking shots--every sort of moving camera shot known to man was to be used in the making of THE LOST WORLD. Model shop supervisor Lorne Peterson was in charge of creating the 1/8 scale ship that blasts through the San Diego dock. 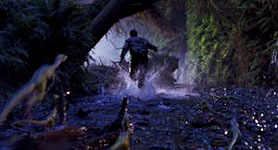 Digitally composited into the miniature scene were bluescreen shots of people running, as well as stage-shot water and splash elements. The most significant advance made by the Industrial Light & Magic team for THE LOST WORLD is their seamless integration of CGI elements in non-static background plates. JURASSIC PARK revolutionized the use of CGI character animation, and THE LOST WORLD will undoubtedly push the industry to use more dynamic camera movement in plate photography, and use their talents in lighting and matchmoving to seamlessly integrate CGI elements into the footage. Both of the stills below are from moving camera shots, including hand-held tracking shots and dolly moves. Like the original, all full-motion dinosaurs (shots of dinos where one can see the animal from head to toe) were accomplished by ILM's character animation. 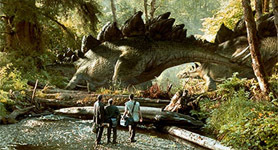 When shooting these sequences, actors were forced to imagine an enormous dinosaur bearing down on him or her, while the cameraman frames the shot appropriately so that a dinosaur can be added in post-production. Closeups of dinosaurs were realized by Stan Winston Studio's creature shop, whose creations were used on-set and interacted with actual actors and props. THE LOST WORLD features a plethora of new and exciting dinosaurs. A new species is introduced in the film's first scene, where a child meets up with a group of tiny dinos, measuring only a foot in height. As more and more of these dinos surround her, the camera pulls back and tracks the girl trying to evade the animals. The CGI dinos performed admirably in this sequence, kicking up sand, casting accurate shadows, and the virtual camera matching the production camera with every step. These tiny dinos make another appearance in the film as they stalk and kill a hunter, later in the film. Once again, the animation, lighting and matchmoving remained crisp and believable. Our heroes drive into the Jurassic Park stadium attraction. ILM created this invisible effects shot nearly in-camera, with model miniatures shot motion control. When Malcolm arrives on the island, he meets up with his girlfriend Sarah Harding (Julianne Moore), as well as a family of Stegosaurus. These CGI dino shots, some of only a handful that take place in broad daylight, are awe-inspiring, and free of any digital artifacts. Within the scene, Harding gets extremely close to the Stegosaurus baby, in this case, realized as a creature creation by Stan Winston. When the baby appears on screen, The Difference is noticed. I define The Difference as the moment where the audience is brought out of the movie by noticing the two very different techniques used to create the dinosaurs (real life creatures, and CGI animation). As the baby's body appears, it is obvious that it is a creature effect, due to the subtle differences in the dino's texture, lighting and movement as well as the subtle differences in how the camera moves. This unfortunate discovery on the viewers' part takes them out of the movie for a brief moment. In a wonderful sequence, hunters attempt to capture dozens of dinosaurs in a scene reminiscent of wildlife documentaries. 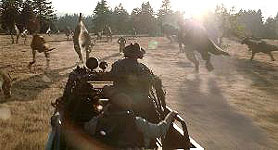 The scene takes place in the blazing sunshine, and the lighting and matchmoving of the CGI dinosaurs make the dinos seem to exist right in front of the camera. The last shot of the sequence is of a huge dino falling to the ground, and for a brief moment, the animation and compositing of the dust around the dino seemed a bit synthetic. The T-Rexes make their triumphant appearance and attack the heroes' trailer, but not before enjoying a quick meal. In a surprisingly violent moment in the film, one T-Rex grabs a human in his jaws, flips the man over, catches him in his mouth, and the T-Rexes both lock jaws on the man, ripping his body apart. For this film, all animation was handled by 3D character animators (as opposed to the original film, which utilized a stop-motion-capture unit for some shots), and the animation of the T-Rexes are quite naturalistic and organic. An amazing, non-dinosaur-related effects sequence takes place as the heroes' trailer dangerously dangles over a cliff. A combination of full-scale setups and clever digital compositing of live action, miniature elements and CG elements make this scene quite memorable. 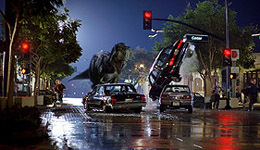 These two images are both from a T-Rex attack sequence, which takes place at night in the pouring rain. Both images are stills of violently-moving camera shots. As the film goes on, the ILM CGI department shines in wonderful sequences of T-Rexes and Velociraptors attacking the humans, all within hand-held photography and other moving shots. The animation continues to shine, even as T-Rex goes on a rampage through downtown San Diego in an awe-inspiring climax to THE LOST WORLD. The night sequence sees T-Rex bringing down telephone poles, flipping over cars, and drinking from a family's backyard pool. The animators must have had a blast animating T-Rex walk underneath a gas station's roof, walking down a suburban street, or smashing through a warehouse wall. CGI lighting and matchmoving in all of the San Diego shots were, you guessed it, consistent and quite extraordinary. There are a lot of fun things to look at in THE LOST WORLD, more than can be mentioned in this one review. The film itself probably has less characterizations than the original film, and does not have any of the heart and soul of previous Spielberg outings. The fact is that THE LOST WORLD is a rollercoaster ride, without much of a pretense of being a significant, touching film. Sorely missed in this sequel is cinematographer Dean Cundey who photographed the original. THE LOST WORLD was shot by Janus Kaminski, winner of the Oscar for his work in SCHINDLER'S LIST. 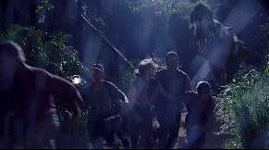 The film's production lighting is quite bleak, uninspiring, and excessively dark, which seems inappropriate for a fun, action-packed thriller like THE LOST WORLD. Since the beginning of process and special effects photography, static shots have been the big giveaway that the shot was, indeed, a process shot. Keeping the camera still makes the effects artists' job a lot easier in matching up all the elements within the frame. Ensuring that effects shots match the clean, non-effects shots that are edited around them are the best way to keep effects invisible to the viewer, and THE LOST WORLD certainly succeeds in this respect. The film is a frenetic, wild chase, and the effects shots do not betray the film by resorting to locked down effects plates--instead, the effects shots match its surrounding footage. Check out Cinefex 70. Check out American Cinematographer June '97.